Simon Keenlyside, baritone, on his Venus figurine pendant. SK I was always fascinated with the earliest artifacts and paintings made by modern humans, from up to 50 000 years ago. One can only imagine the power that totemic objects might have had tens of thousands of years before writing was invented: the earliest known Flute 38 000 years ago, or a reindeer bone, broken but still playable and possessing the holes that would indicate its tonality. I wonder how it sounded? All those Paleolithic paintings and the stories that they nearly tell! And then? 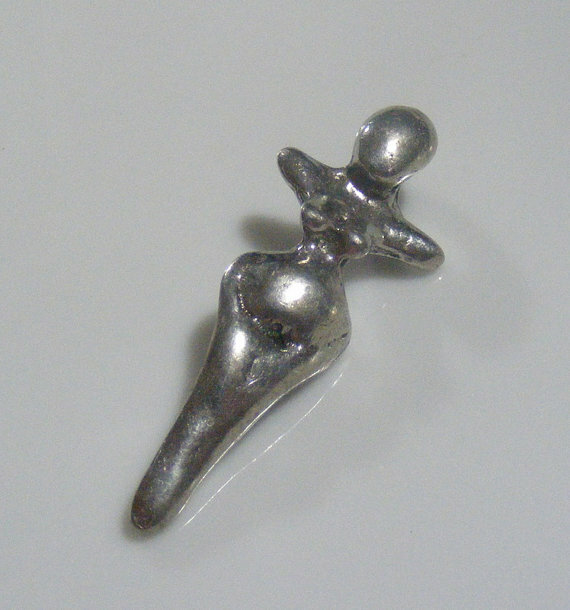 Then there are the Venus figurines. Nobody quite knows what they are. They’re called fertility symbols. It would have taken resources and plentiful food for a woman to attain such massive proportions in her hips, breasts and posterior. The gathering of food would have been an indicator of power in a family or tribe. All of this, however, must remain a best guess. And then I watched the birth of my own children on the kitchen floor and nothing was ever the same for me again. After that, language itself was suddenly utterly inadequate to express the maelstrom of incomprehension and wonder at what I’d witnessed. At that point I felt much like Michelangelo’s figures in the roof of the Sistine chapel – arms outstretched and fingers almost touching. At THAT point I also felt kinship with the people who made the ancient figurines. GB Do you have your own theory about why the figurines were made? SK It doesn’t matter if I am wrong in my thoughts about them. Whether it was men who made them, as I believe – expressing their own wonder, gratitude, relief, expectations – all the rest of it. Or whether they were made by women expressing their own sense of Matriarchal power. Whether these things had a religious component or not will never be known. For me they somehow express all that I cannot. Without wanting to descend into maudlin sentimentality or muddle-headedness, the witnessing of a birth and subsequent to that my stewardship of a child’s growth and development, is all encapsulated in that little Venus figurine. The love for its Mother, my partner, also deepened as a consequence, as a matter of course, and without choice. “Why wear one at all? You have the children in front of you…” I hear you cry. Well, its fun, that’s all: It makes me smile. Why wear any jewellery? Why wear a wedding ring? Why necklaces? Why most things in this hurly-burly life? GB Is the fact that these figurines are prehistoric part of their attraction to you – that they have this mystery surrounding them? SK What is known about these figurines is that in their most sophisticated forms, some possessive of hairstyles and indication features of dress (somewhere between 15-35 000 years), they are found all over present day Eurasia: from Siberia down to Trieste, to Andalusia in Spain, as well as throughout France, Germany, Austria, Slovenia and Croatia. The figurines appear in almost precisely the same form wherever they are found and over many thousands of years. It’s fascinating to consider how many must have been made in Africa before the various exoduses. But recent climate and conditions have not been conducive to the preservation of figurines. But the figurines on their own are not the only reason I cherish my twenty or so replicas. There is something more; even more wonderful about these things. Whilst these Venuses remained homogenous over thousands of miles and for thousand upon thousand of years, (already a mind-boggling fact) some also, slowly, over time – from 38 000 years to 15 000 ago for example – became more stylized. Some had holes in their backs as if to hang them on cave walls. For almost their entire existence the Venus figurines were made by nomadic peoples. Humans had not yet learned to settle in one place. Little by little they changed. The crook in their arms, which from the beginning had cradled their huge breasts, or perhaps indicating a child suckling there, straightened out. Their arms stuck out perpendicular to the body. The elbows disappeared. The breasts reduced. The legs became elongated. The feet became reduced or stylized to almost nothing. The head became smaller. The end result is unequivocally what anyone would recognize as a crucifix. These figurines seem to disappear around 5000 years ago. Is it a coincidence that they do so at a time when human society becomes more sedentary? When agriculture and (more importantly) writing begin to develop? Would that lessen the need for totemic objects? I don’t know, but the figurines seem to disappear. And yet, if I were able to show you a photographic sequence of these Venus figurines over time, I believe that you would see immediately that they do not disappear at all. What happens is that they are assimilated into the next pan-Eurasian totem, namely the Crucifix. Christians should not be offended by what I’m saying. We know very well that some of the most important and sacred aspects of previous religions in recent prehistory, the so-called pagan ones, were assimilated by the new. The holly, ivy, rabbits, harvest festivals, round churches, all date from pre-Christian times. They are no threat to present day believers. But if I am right then these Venus Figurines, already the most potent and longest-lasting totems in all of human history to date, for me, are all the more powerful – in that they stem, one way or another, from something to do with the processes of Nature and birth and survival, rather than any dogma. GB You’ve chosen something so far away from the world of opera and music that you work in. SK Well, yes it self evidently is. However, I have had the great privilege of a long immersion in the art form in which I live. One thing that has become abundantly clear is that music is no different to all other art forms in respect of the fact that it is often born out of a need to express the tectonic frustrations and celebrations of the human condition. The fact that it is so stylized is irrelevant. The messages and discussions in all theatre and opera pertain to ALL human life. So in that sense my Venus figurine is not so very far away from literature and art and music. GB Does the beauty of the music that you live with stay fresh for you? SK Yes it does, because for me, music is a mirror to real life. Oblique it may be, but no less relevant for that. SK Lovely question. Consider Goya’s ‘unfortunates’. Those in society who slipped through the cracks and ended up as beggars or in mad-houses. They are as beautiful to regard as any beauty depicted by Velasquez. Or the cursing of love shrieked by Alberich in Wagner’s Ring cycle. Would it be any more beautiful if sung with a most wonderful tone? No! The very ugliness of that is its very power. The unimaginable destruction of a supernova exploding from a distance is mere art. I dare say from closer it would be something else? The down-bow of a cello wood-on-string at the beginning of some Razumovsky string quartet – the roughness of that sound is beautiful in that context. My point? That beauty is context. Everything is beautiful if examined carefully enough. Most people would probably agree that capturing something mundane and considered of no worth, such as the cigarette stub on the ground in front of me now would be a thing of wondrous beauty if captured and represented in a painting or photograph by great Master. And yet is it still beautiful to contemplate just as it is? Maybe? Close up? Under a microscope? Juxtaposed with a ruby ring? Who knows? Not me. Beauty is still all in the eye of the beholder. All good clean fun to contemplate.